This week’s episode of The Goldbergs serves as a pay-off to two of the season’s longest running gags. One acts as the catalyst of the A-plotline (Murray’s aversion to change in routine) whilst the other makes for the requisite emotional pay-off in the B-plotline (Barry’s hellish high school life). After Patton Oswalt’s opening narration emphasizes how steadfast Murray Goldberg is in his routine, the episode’s titular storyline commences with Beverly selling Murray’s aged, beloved armchair. She claims the chair was too old and that getting rid of it was “for your own good.” Thus, the first shot in a domestic war is fired. Murray proceeds to replace the kitchen stove—the cornerstone of Beverly’s world (no way to phrase that without sounding sexist, I guess)—with a new invention called a microwave. Beverly strikes back by replacing Murray’s tighty-whities, Murray takes away Beverly’s hair spray, and so on. The entire time, the two justify each of their passive-aggressive stabs by saying, “It’s for your own good.” Eventually, in an attempt to crush their fight, Beverly locates the old chair, which has fallen into the possession of a dirty frat house and offers her services as a cleaner/Mom-for-hire in exchange for it. “For Your Own Good” stands as perhaps the most overt Beverly-Murray pairing since last year’s “The Ring.” And while they typically get at least one or two good exchanges per episode, it’s nice to have Jeff Garlin and Wendi McLendon-Covey get some major screen time to really work against one another. Granted, the nature of their feud and its rapid escalation contains elements that date back to early Honeymooner episodes, but it’s a cliché for a reason—it’s funny if done right. 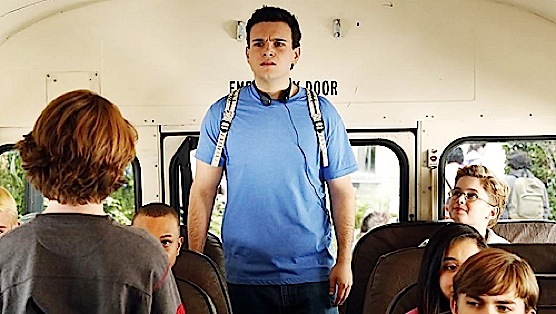 The B-storyline finds Adam recruiting Barry to ride the bus with him in an attempt to gain protection from middle school bullies. With his unpredictable temper (the kids first see Barry smashing the mailbox after his Sports Illustrated football phone fails to materialize), Barry commands the respect of the younger crowd. Naturally, this goes straight to his head, and soon he has declared himself prime bully of the bus. There’s still the requisite sentimentality in the final act, but it’s more low-key and nonintrusive here than in previous episodes. The lone exception comes at the end of the Adam-Barry story wherein Barry confesses that he went power hungry because everyone at high school treats him poorly and Adam’s bus was the one place he felt in charge. Luckily, the episode doesn’t push the moment too hard, though Adam’s claim that he “didn’t know” about Barry’s high school woes seems very unlikely considering Barry tends to make this fairly obvious. (It was even the source of a very funny joke in “Goldbergs Never Say Die!) I’m not saying the show needs an Wire/Game of Thrones-level adherence to continuity, but this emotional beat can’t help but feel a tad forced. Also, wasn’t Barry elected his school treasurer a few episodes back? Shouldn’t that have provided him with somewhat of a respite? On that note, I seriously would like a few moments of Barry attempting to do his treasurer job. Hell, accounting-according-to-Barry could probably make for its own amusing subplot. “For Your Own Good” rides that line between something that’s genuinely funny and something that’s merely sporadically very amusing. It’s a tough call. Judging sitcom comedy on a week-to-week basis is often a confusing, strange process. By its very nature, it’s consistent, so an episode would either have to be really good or really bad to merit extreme thought. In regards to The Goldbergs, sometimes I have a lot to say while other times I’m grasping at straws. This episode falls somewhere in the latter category. Because the show creates such a delightful, fun world, however, even when it’s merely solid, I still find myself happy to be watching. Oh, and one last thought—what the hell is up with those shirts that change color when you touch them? Was that seriously real? No offense to whomever created it, but that is literally the worst clothing idea I’ve ever seen.